The Central Bureau of Investigation (CBI) is the premier investigating agency of India. CBI’s history could be traced to the executive order made by the Government of British India in 1941 for setting up the Special Police Establishment (SPE) during the World War II when large sums of public money were being spent in connection with the War and there arose enormous potential for corruption amongst the officers dealing with the supplies. Therefore, CBI was formed in 1941 as the Special Police Establishment. (1) The superintendence of the Delhi Special Police Establishment shall vest in the Central Government. Also, under this Act, the superintendence of the SPE was transferred to the Home Department and its function was enlarged to cover all departments of the Government of India. The jurisdiction of the SPE extended to all the Union Territories and could also be extended to the States with the consent of the concerned State Governments. The Central Bureau of Investigation was established on 1.4.1963 vide Government of India’s Resolution No, 4/31/61- T/MHA (Home Ministry). This was done to meet the felt need of having a central police agency at the disposal of the Central Government to investigate into cases not only of bribery and corruption but also those relating to the breach of central fiscal laws, frauds in government departments and PSUs and other serious crimes. As the CBI, over the years, established a reputation for impartiality and competence, demands were made on it to take up investigation of more cases of conventional crime such as murder, kidnapping, terrorist crime, etc. Apart from this, even the Supreme Court and the various High Courts of the country also started entrusting such cases for investigation to the CBI on petitions filed by aggrieved parties. Therefore, due to the increased workload and new nature of work three Investigation Divisions, namely, Anti-Corruption Division, Special Crimes Division and Economic Offences Division were created under CBI. Therefore, now CBI is under the jurisdiction of the Ministry of Personnel, Public Grievances and Pensions, which is headed by the Prime Minister of India. Central Vigilance Commission (CVC) is an apex Indian governmental body created in 1964 to address governmental corruption. In 2003, the Parliament enacted a law conferring statutory status on the CVC. It has the status of an autonomous body, free of control from any executive authority, charged with monitoring all vigilance activity under the Central Government of India, advising various authorities in central Government organizations in planning, executing, reviewing and reforming their vigilance work. It was set up by the Government of India Resolution on 11 February 1964, on the recommendations of the Committee on Prevention of Corruption, headed by Shri K. Santhanam Committee, to advise and guide Central Government agencies in the field of vigilance.The CVC is not an investigating agency as there is difference between inquiry and investigation: inquiry refers to proceedings conducted by a Court or a Magistrate, and an investigation refers to the proceedings or steps taken by an authority like Police Officer and mainly comprises the process of collection of evidence, ascertainment of facts, discovery and arrest of suspected persons, determining whether on the basis of facts and evidence collected there is a case to put the accused on trial or file a charge sheet, etc. The Central Vigilance Commission (CVC) shall be given statutory status. Selection for the post of Central Vigilance Commissioner shall be made by a Committee comprising the Prime Minister, Home Minister and the Leader of the Opposition from a panel of outstanding civil servants and others with impeccable integrity, to be furnished by the Cabinet Secretary. The President on the basis of the recommendations made by the Committee shall make the appointment. This shall be done immediately. The CVC shall be responsible for the efficient functioning of the CBI. While Government shall remain answerable for the CBI’s functioning, to introduce visible objectivity in the mechanism to be established for overviewing the CBI’s working, the CVC shall be entrusted with the responsibility of superintendence over the CBI’s functioning. Section 8 of the CVC Act conferred on Central Vigilance Commission (CVC) the power of superintendence over the Delhi Special Police Establishment insofar as it relates to the investigation of offences under the Prevention of Corruption Act, 1988; or an offence under the Cr.PC for certain categories of public servants. Also, under the Section 8 CVC can review the progress of investigations conducted by the DSPE into offences alleged to have been committed under the Prevention of Corruption Act, 1988 or an offence under the Cr.PC, and review the progress of the applications pending with the competent authorities for sanction of prosecution under the Prevention of Corruption Act, 1988. Also under Section 4C of DSPE Act, 1946 The Central Government shall appoint officers to the posts of the level of Superintendent of Police and above except Director, and also recommend the extension or curtailment of the tenure of such officers in the Delhi Special Police Establishment, on the recommendation of a committee consisting of : – (a) The Central Vigilance Commissioner – Chairperson; (b) Vigilance Commissioners – Members; (c) Secretary to the Government of India in Charge of the Ministry of Home – Member; (d) Secretary to the Government of India in charge of the Department of Personnel – Member. Provided that the Committee shall consult the Director before submitting its recommendation to the Central Government. Section 4 of DSPE Act, vested the power of superintendence over the Delhi Special Police Establishment in Central Vigilance Commission. Section 4A (1) of DSPE Act, provided for Committee for appointment of Director of CBI – The Central Government shall appoint the Director of CBI on the recommendation of a committee consisting of the Central Vigilance commissioner as Chairperson, the Vigilance Commissioners, the Secretary to the Government of India in-charge of the Ministry of Home Affairs, and the Secreatary (coordination and public grievances) in the Cabinet Secretariat. Section 4B (1) provided that the Director shall, notwithstanding anything to the contrary contained in the rules relating to his conditions of service, continue to hold office for a period of not less than two years from the date on which he assumes office. (2) The Director shall not be transferred except with the previous consent of the Committee referred to in sub­section (1) of section 4A. 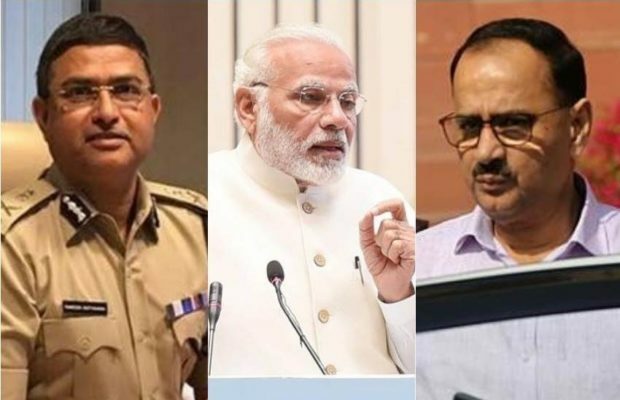 Facts:The feud appears to have started when the director Alok Verma filed a complaint with the CVC opposing the appointment of Rakesh Asthana as special director CBI, a year ago in October 2017, on grounds of corruption and that Mr Asthana was himself under investigation. Despite the objections raised, Mr Asthana was brought in. The bad blood between the officers led to the Mr Asthana filing detailed complaints against the director with the CVC for interfering in probes and accepting bribes in several politically sensitive cases, in August 2018. Precipitating the matter, the director filed an FIR against Mr Asthana and another officer Devender Kumar, for bribery and corruption. Subsequently, the Central government appointed an Interim Director, M. Nageswara Rao. Verma and Asthana were both placed on immediate leave on 23rd October 2018, a first in the history of the CBI. Finally, the two petitions, one filed by Alok Verma (CBI Director) and one by the NGO Common Cause challenged the Centre’s order which had divested Director Verma of his powers. The petitioners argued that the Central Government’s actions against Verma violated the provisions of the DSPE (Delhi Special Police Establishment) Act and the Supreme Court guidelines issued in Vineet Narain, 1997. The Supreme Court took up the matter for hearing directed the CVC to complete the enquiry against Alok Verma in two weeks under the supervision retired Supreme Court Judge AK Patnaik. 1) Did the action taken against CBI Director Verma violate the provisions of the Delhi Special Police Establishment (DSPE) Act, under section 4B (2)? 2) Did the action against CBI Director violate the rule of fixed tenure, which was introduced by the SC guidelines in Vineet Narain case, under section 4B (1)? 3) Do the Central Vigilance Commission’s powers of supervision extend to investigating charges against CBI personnels, under the CVC Act, 2003? DECISION: SC held that the actions taken against Director Verma amounted to a transfer. Therefore, it quashed the actions, as they had not gained prior approval by the High Power Committee. In doing so, the Court reinstated CBI Director Alok Verma and removed Nageswara Rao as Acting Director. It also directed the High Power Committee (also known as the Selection Committee) to rule within 1 week on whether Director Verma should be divested of his duties and functions. The Committee comprises the Prime Minister, the Chief Justice of India and the Leader of the Opposition. It consists of: a Central Vigilance Commissioner – Chairperson; and not more than two Vigilance Commissioners – Members. The Central Vigilance Commissioner and the Vigilance Commissioners shall be appointed by the President on recommendation of a Committee consisting of the Prime Minister (Chairperson), the Minister of home affairs (Member) and the Leader of the Opposition in the House of the People. It superintendents over functioning of the Delhi Special Police Establishment, and also to review the progress of the investigations pertaining to alleged offences under the Prevention of Corruption Act, 1988 conducted by them. It inquires or causes an inquiry or investigation under Section 8 of CVC Act, 2003, and has all the powers of a civil court while conducting any inquiry as per section 11. Any Ministry/Department does not control the CVC. It is an independent body which is only responsible to the Parliament. Nittoor Srinivasa Rau, was selected as the first Chief Vigilance Commissioner of India. K. V. Chowdary is an officer of the 1978 batch of Indian Revenue Service (IRS). He assumed the charge as Central Vigilance Commissioner on 10 June 2015. He has served as Chairman of the Central Board of Direct Taxes (CBDT). In 2015 he was appointed as the Central Vigilance Commissioner. Vineet Narain (born 1956) is a prominent Indian journalist, anti-corruption activist and conservator of heritage. His exposure of the 1990s Jain Hawala scandal led him to use a public interest petition to apply pressure on the Central Bureau of Investigation.